Hi loves, I hate to say this but winter is here, we were pretty lucky with warm weather in December but that sure as heck didn't last long. Winter may be unpleasant but it doesn’t mean you have to dress like it. Here are some of my winter fashion favorites! Stylish and warm, comes in so many different sizes, material and prints, what more can you ask for. When I have to get ready quick or if I'm just honestly feeling lazy, my go to is jeans, basic top, and a scarf to spice up my outfit.They are so versatile, whether it's a casual outfit or a night out. I’m all about boots, any type- knee high, riding, ankle booties, I’m there. How fab are all of these, I need!!! 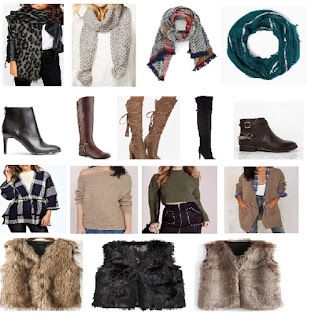 Yes, I know sweaters/cardigans can be a tad bit boring but if you find the right sweater and style it properly, you won’t feel like a frumpy grandma! Need I say more, every fashionista needs one or maybe two in their closets!!!! They are just so effortlessly glamorous, making you feel like a million bucks! Let me know some of your favorite winter fashion pieces. Love that asos leopard scarf!! I need me one of those faux fur vests!! !